When compasses were originally created, they weren’t actually used for spatial navigation. Instead, they were used as divination instruments, meant to guide people spiritually. Compasses first showed up in China during the Han Dynasty, and it was only in the 11th century that they became popularly used as navigation tools. Below, we’ve put together a compass tattoo dictionary, spelling out the meaning behind each one of these tattoo designs. Anchor Compass: since the anchor is common symbol of Christian faith, the anchor compass tattoo design represents religious guidance. Celtic Compass: a close relative to the Celtic trinity knot, the Celtic compass tattoo design shows pride in one’s ancestry. Heart Compass: this tattoo designs symbolizes a willingness to let your heart guide your actions in life. Map Compass: for those adventure seekers and explorers, the map compass tattoo design symbolizes a passion for travel and discovery. Nautical Compass: the nautical compass tattoo design represents peace and harmony. Rose Compass: a rose compass symbolizes a passion for romance and a search for love. Star Compass: the star compass tattoo design is based on the North Star, which sailors would use to orient themselves at sea. It represents those who are seeking guidance. 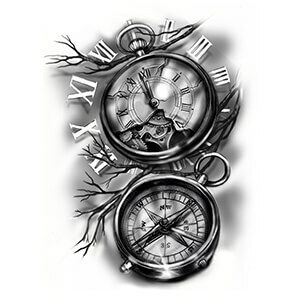 Vintage Compass: the vintage compass tattoo design is suited for a lover of history. For those who have spent time in the Navy, it also represents protection. Representing anything from guidance and protection, to a search for your passions, compasses have a strong history of symbolism in many cultures and as tattoo designs. Whether you want to honour your heritage or you’re seeking direction in your life, a compass tattoo design can stand as an excellent choice. If you know of any other compelling compass tattoo designs, let us know about them in the comment section below!